We recently had the opportunity to attend the Formula E Rome ePrix, one of the more exciting races of the season. 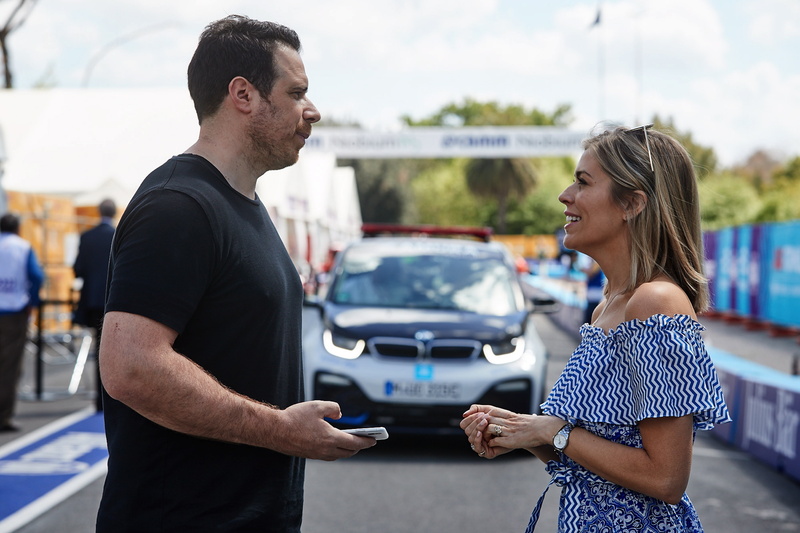 While we were there, we were able to sit down with Nicki Shields, TV Presenter and current Formula E Pit Lane Reporter, as well as BMW i Brand Ambassador in the UK. She’s had a fascinating career, one that didn’t start off in the world of motorsport but now she’s become the face of Formula E.
Growing up in Twickenham, UK, Nicki first entered the world of TV broadcasting in 2012, becoming a presenter on BBC’s “Escape to the Country”. Before being a television presenter, Shields was in banking, handling Swiss accounts. But after realizing that banking wasn’t what she wanted to do, she left. In 2014, Ms. Shields was selected as the presenter and pitlane reporter for the new Formula E season, becoming one of the first reporters to be fully immersed in the world of electric racing. So in the interview below, we asked her about her start into the world of motorsport and how that came to be. BMWBLOG: Where did your love for electric vehicles come from? Nicki Shields: I decided, banking, what am I doing? So I left banking and decided to get back into broadcasting. I then did a show on sustainability. It was amazing, actually. We followed an explorer in the Arctic. We did lots of spin-off stories around it, basically promoting climate change. And one of the stories we did was about electric vehicles. This was when they were really uncool, really slow, no range. But I did an interview of Renault and they told me about this new racing championship called Formula E. I love racing, I’m a complete petrolhead. My Dad loves Formula One so when they told me about Formula E, I was like, “oohhh”. BB: Why should fans fall in love with Formula E versus Formula One? NS: I think getting involved and watching a race are two different things. If you’re just purely about watching a race, it’s quite simple. The pure enjoyment, the pure entertainment, the incredible racing, the caliber of the drivers. We’ve got Le Mans winners, Endurance champions, ex-F1 drivers, we’ve got ’em all. It’s also so competitive and they’re on street circuits. I suppose in terms of being involved, the bigger picture, there isn’t really a bigger picture in Formula One, where as in Formula E there is a bigger picture [speaking about the future of electric cars]. BB: How do you see the sport evolving in the next five or ten years? NS: The biggest thing is that it will become more popular. We have 12 races in 10 cities, which are probably enough for now. Do we know to go to more places? Obviously the more the better, but the lineup and locations we have now don’t need to be changed. We aim to get more fans to experience it live, to enjoy it. BB: Next year, they’re coming out with a new car with a larger battery. So they’re (FIA) thinking about getting rid of the pit stop. What do you think about that? NS: Personally, I’m very sad because, strategically, it’s just a great element in the race. So yes it is sad but it’s also ironic because it was a thing that was laughed at initially, to have a driver jump out a swap cars [midway through the race] but actually it’s brilliant to watch. However, I think the FAA are slightly going to change the rules, so there will be two different power settings which will add a new element of strategy, but the full details are yet to be revealed. BB: Any advice for women around the world, how to make it in a male-dominated world? NS: Most importantly, you need to have a passion for it, or else don’t bother. You need to tough about it. Be confident. Know the sport, watch the sport. Do your research, do your studying. And give those boys a run for their money (laughs)! Give as good as you get. You still have to put up with typical male behavior but I think once they get to know you and respect you for who you are and if you both share the same passion in the sport then they’ll respect you. BB: BMW is coming next year, so is Jaguar, Porsche and Mercedes. What are your thoughts on new brands coming into Formula E? NS: So obviously this year, Audi joined and next year it’s BMW, Porsche and Mercedes. To have the big four German manufacturers says a lot for the championship. And the fact that Audi decided to leave the Endurance championship for Formula E shows that electrification is the way forward and these major brands really believe in it. It’s going be interesting in terms of competitiveness and also in keeping the budgets at a fairly balanced level. It’s great that we have all these big manufacturers onboard but Formula E needs to be careful to maintain a level play field. BB: So tell me about your partnership with BMW UK? NS: So I’ve been working with BMW for the last two years. My Dad is a BMW nut, he’s sort of gone through the ranks. Used to be 3 Series, 5 Series then M3 M4. So I’ve always been a BMW girl in a BMW household. So the BMW UK team and I have decided to work together about two years ago, which has been great. It’s given me the opportunity to drive cars before anyone else does. I drive an i8 and an i3 and I love them both in equal measure, I really do. Everyone thinks automatically that the i8 would be your favorite, but I love the i3, it’s the greatest car and many petrolheads that drove my i3 fell in love instantly. Instant acceleration and when you drive in a city, with the strict speed limits, I am technically that my dad’s M4. I love its design and the different sustainable materials inside, and of course, the cabin space. Of course I like the turning circle and I’m fine with the driving range. BB: You just drove the BMW i8 Roadster in South Africa. Tell me about that. NS: My new love affair. First of all, we were in South Africa, Capetown, and we had this private road where you could put your foot down. It was amazing because, having the roof down, at the rear the design is just stunning. Even with the roof on, I prefer the roadster over the coupe.